Never let it be said that we push a consistent party line here. On the one hand, CU shares his up-beat fortunes (and occasional misfortunes) in the equities. I on the other offer doom, gloom and precious metals. In the middle, Mr Q keeps our spirits up with tales from the High Street and the doings of Brownadder. Following CU's latest update, a quick word about the preciousss. Things were looking toppy at the start of the week, and so it proved. I have come to view silver as the vehicle for in-and-out moves, and for once I sold at the top (having missed that trick on 1 May): the Drew silver account is a bit more than 40% up on the year. As anyone can figure out, that is by no means optimal, proving I am no trader. But I have left the longstanding gold position in place, and thus missed out on the 20:20-hindsight 10%-in-2-days on offer. Why ? Because from where I am sitting, gold looks inexorable. Look at the chart (source: 'economicfreefall') - what is a 10% twitch against that trend ? Less than the previous 2 weeks gains, that's what. The bottom line approximates very closely to the 144-day moving average, the significance of which is that silver bottomed on the 144MA after the May massacre, and then resumed its bumpy ascent. There was, in my view, no way that 2008-9 was just a nasty bout of recession. The only trick up the sleeves of Gordon 'PFI' Brown, or Ben 'helicopter' Bernanke or whomever, is that dealing properly with problems can generally be postponed. For a bit. Theories of what is happening abound: here's one you may care to read. Sometimes, to quote Brute Anderson from the DTel yesterday, what's needed is "some old-fashioned Tory pessimism". great play this year ND. bernanke was cute today, pushing news of next steps out for 3 weeks to stop the markets boiling over one way or another. hard to dispute that things get worse from here, my inner bull is sickly. ND said: ... gold looks inexorable ..."
Any idea when I should sell my gold coins then? I'm not bothered by hyperinflation, I'm fairly young, fairly heathy, have a half decent job with half decent career prospects. I do with I'd bought some silver and gold coins a while back as insurance (I reckon decent bottles of malt on a loss leader is the other way to go for som bargaining chips). But it'll probably correct a lot of things that need correcting if it comes. The real doomsday scenario is if he worlds computers stop working. Crazy, but the bubble won't burst for a while. Personally, I'm not concerned with hyperinflation, the end of the world etc just "bog standard" inflation or (worse) stag-flation; so long as oil prices stabilise. 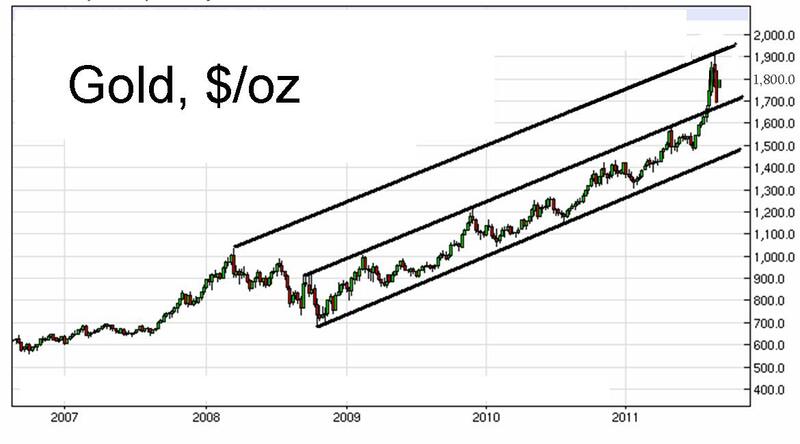 LedZepTT, those that hold gold are dependent on fresh buyers coming in to prop up the price. Those currently buying gold do so, not out of necessity, but because the price is rising. This is, of course, the definition of a Ponzi scheme, though gold fanatics don't want to hear the truth about their fixation. Ah, now I see how it all works - the answer is 42. No doubt we are seeing something of a speculative bubble in gold, however, there's a fundamental reason for holding gold; people are losing faith in USD, Sterling and the Euro because there are large structural problems and a likely way they will be tackled is inflation. Well, I never, cosmic. The next thing you'll be telling me is that a ten pound note is really only worth the paper it's printed on. OMG, we're all going to die!